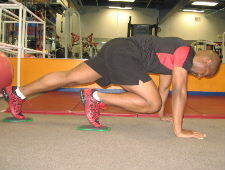 Mountain Climbers are a great gliding disc core exercise. Mountain Climbers by themselves can be used to work the core muscles, and you can use gliding workout discs to give mountain climbers a different feel. Mountain climbers are a great overall exercise. They work your arms and shoulder stabilizers while also working the abdominal and core muscles. Usually, mountain climbers are done in a rapid alternating fashion that will push up your heart rate, but if you move slowly with workout discs under your feet you can really emphasize the core muscles. Below are pictures of mountain climbers using gliding discs. Starting Position: Get into the plank position with your hands on the floor. Then, place your feet on top of two workout discs. Form: While keeping your core muscles engaged, bring one knee in towards your chest. Hold for a brief second and then switch legs. Alternate sides until you've done 10-25 repetitions on each leg. Personal Trainer Tips: To get the most core work, you should move in a slow and controlled manner. When you start in the plank position, make sure that you keep your hands directly underneath your shoulders. This keeps the shoulders in the most stable position. Do your best to keep your torso parallel to the floor. 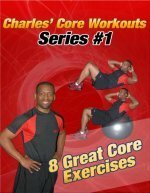 You can do many different core strengthening exercises with gliding workout discs. If you find mountain climbers are too easy, try knee-ins or 1 leg knee-ins. If you're looking for some new exercises to add into your core workout routine, try mountain climbers with gliding workout discs.